CueMix FX provides powerful audio analysis visual diagnostic tools for stereo audio signals, from an accurate guitar/instrument tuner to phase and polarity measurement tools, to a full-fledged oscilloscope. Find out how you can improve your sound with these advanced, yet easy-to-use tools. Just open the Tuner window, play a note, and use the large graphic display to get in tune with an accuracy of one 10th of a cent (one 1,000th of a semi-tone). Being in tune has never been easier. 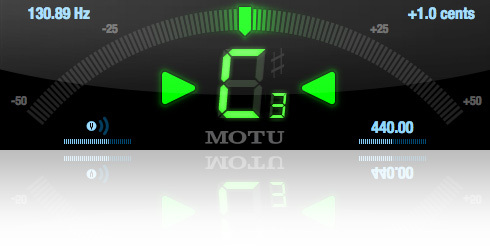 The Tuner displays the detected note by frequency (in Hertz), note name and octave, with an adjustable reference frequency for A4 between 400 and 480 Hz. The large meter gives you a clear indication of how high or low you are from the detected pitch. Large red arrows direct you up or down as needed to zero in on the correct pitch. You can even tune phase-coherent stereo signals. The CueMix FX Tuner is as advanced and accurate as any dedicated hardware tuner out there. CueMix FX provides an optional real-time FFT display super-imposed on top of the graphic EQ curve so you can see as well as hear the effect of your equalization adjustments. CueMix FX also provides real-time spectrogram "waterfall" display that provides rich, detailed visual information about the frequency content of any signal or mix. You can expand the spectrogram to fill the entire resizable CueMix FX on-screen window. You can also combine the spectrogram with the FFT display and EQ curve in the same display, or separate them to view them individually but simultaneously. Stereo material that has phase problems will appear along the x = -y axis meaning the signal will appear predominantly in the upper left and lower right of the display. A signal with an extremely wide stereo field will appear much more randomly (not along either axis). Frequencies that would be canceled by summing to mono are those that touch the -1.0 or +1.0 lines on the left and right. Recording with multiple mics — the Phase Analysis window lets you compare multiple mic sources with each other to check for potential phase cancellation caused by varying distances in mic placement from the recorded source. Checking the overall polarity of a stereo mix — quickly check for phase issues in your stereo mix. Summing to mono — if your stereo material needs to be summed to mono, Phase Analysis lets you see what frequencies will be canceled out when summed. Tuning and checking PAs or sound reinforcement — place mics in strategic locations in your venue to check for critical phase issues in the listening environment. Download and view numerous other examples.